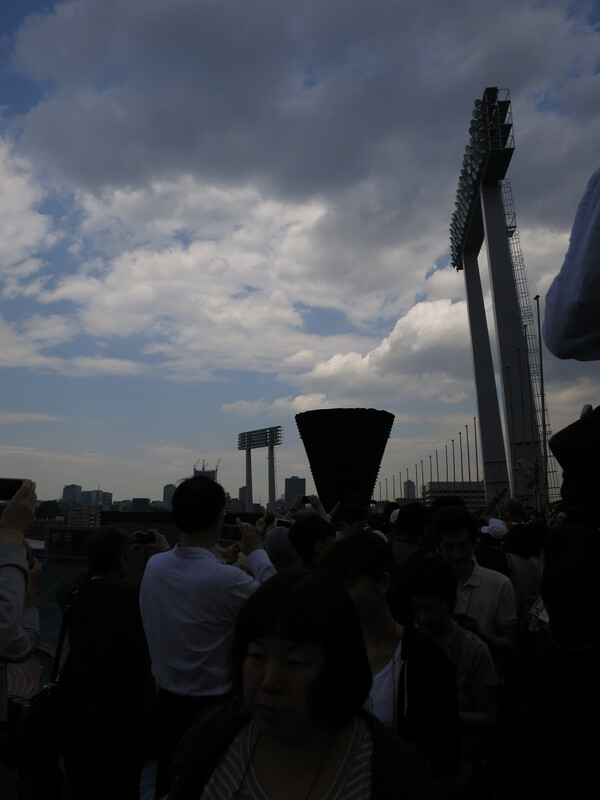 Tokyo – It was the morning of May 22nd, the last day the Japanese National Stadium would be open for tours to the public before renovations ahead of the 2020 Olympics. I took the day off to become part of the 6,000-strong weekday crowd, taking the municipal subway line to take me straight to its North gate. Taking my first and last steps through the gates, I looked to the queue ahead. Snaking across the entrance platform was an excited but orderly crowd, a mix of parents with carriers and strollers in tow, couples, chatty girls and wide-eyed boys. I spotted a few sporting soccer jerseys and some others clad in business suits. They had obviously gone out of their way to take time off for the tour and were all set to get back to work. As we shuffled toward the tour entrance below, some were conspicuously out of line, peering anxiously past the gates while feverishly urging their friends to arrive over the phone as others frantically fingered their smartphone screens. Staff were unraveling more rope to round up the growing queue but a few were already hollering for last-minute entrants ahead of shutting the gates. Time was of the essence. Enjoying the intermittent windows of sun, I gazed upward for signs of rain clouds as a chilly breeze picked up because rain was forecast later in the day. A large menacing mass drifted nearer, threatening to open up and dump whatever it held. As we moved down to the tour entrance beneath, I caught my first glimpse of the track and field through a ground-level entrance. The brilliant green glowed brilliantly beyond the pitch dark entrance. The pitch did not welcome, it drew you in. Restrained by my orderly habit, I prised my eyes away and turned to the queue ahead. I noticed a slightly crooked clock right above the tour entrance, which was laid out haphazardly using a few tables and benches. 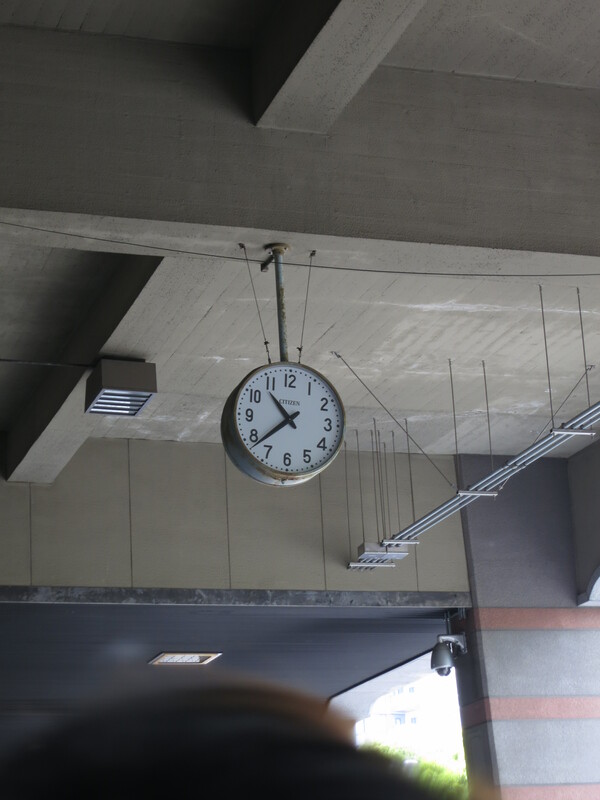 No one really noticed the alignment of the clock above it, except for the time. 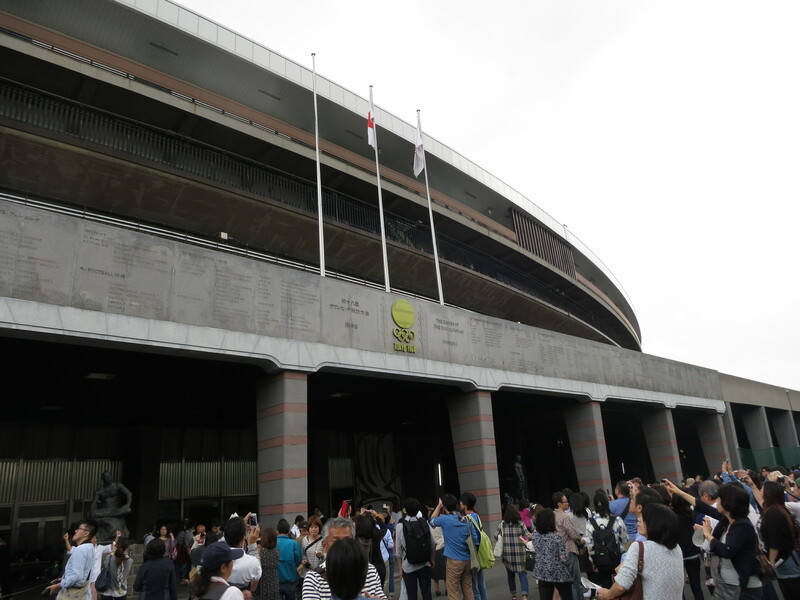 We were in for some history, but first we had to pass by an open cash box, some stacks of papers, and clammy hands snapping away at the 1,000 yen entry fee, before receiving a visitor access pass. 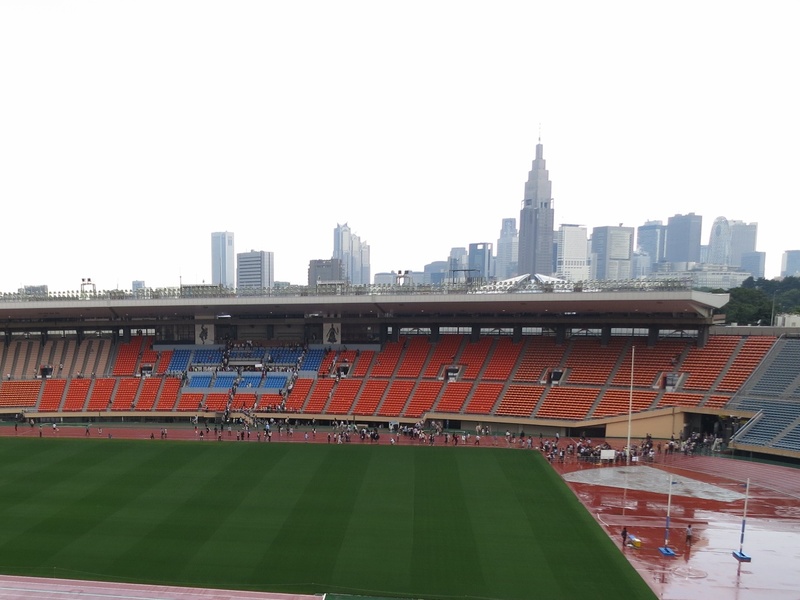 Liberated from the ordeal of the snail-paced queue, I charged out into the open to the curved road around the stadium. 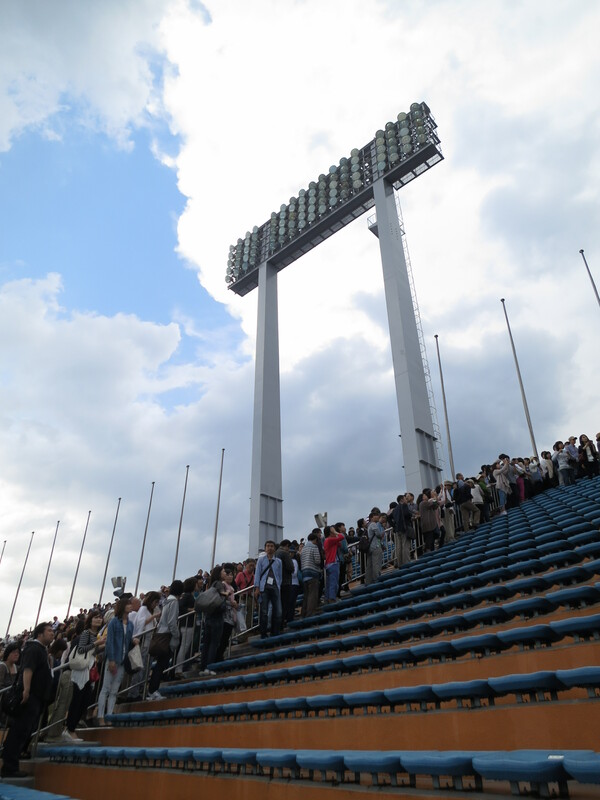 Many were pointing their cameras upward, toward the trident flag posts and the 1964 Olympic winners list. Carved in stone and perched high above us, we stretched to search for familiar names only to be met with droplets of rain. I remembered the momentous triumph of the Japanese women’s volleyball team and snapped a few quick photos before dashing off past another crowd (and winners board) to the main attraction: the sporting arena within. By then, some brollies had gone up but sports enthusiasts are not the weakly kind. I found myself angling for a shot of the pitch among the many lined up along its perimeter. 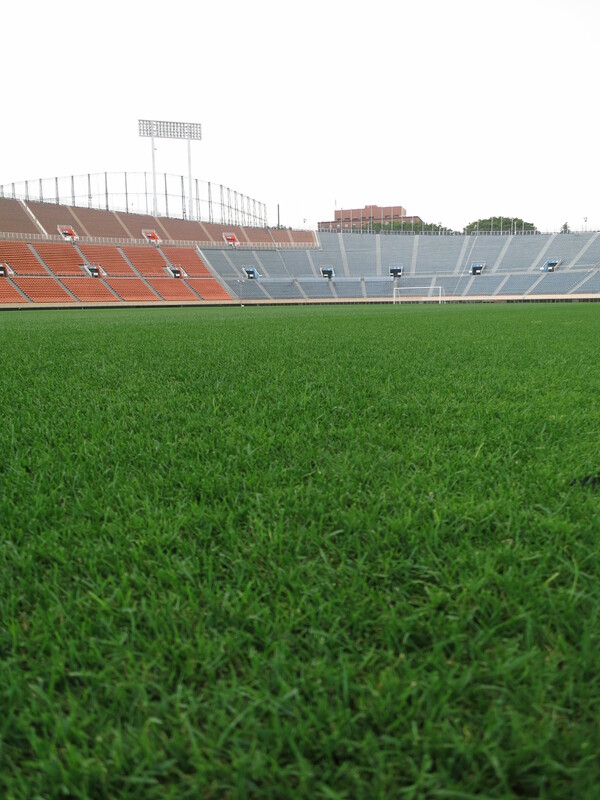 Some crouched down to caress the grass while others stood still to enjoy the expanse of the pitch and the ground-side view of the main stand terraces. As the droplets fell harder, the field embraced it and glistened vividly. Any joy was soon dampened as the winds picked up and forced us to take shelter. One brave figure remained on the tracks under an umbrella as the heavens opened. 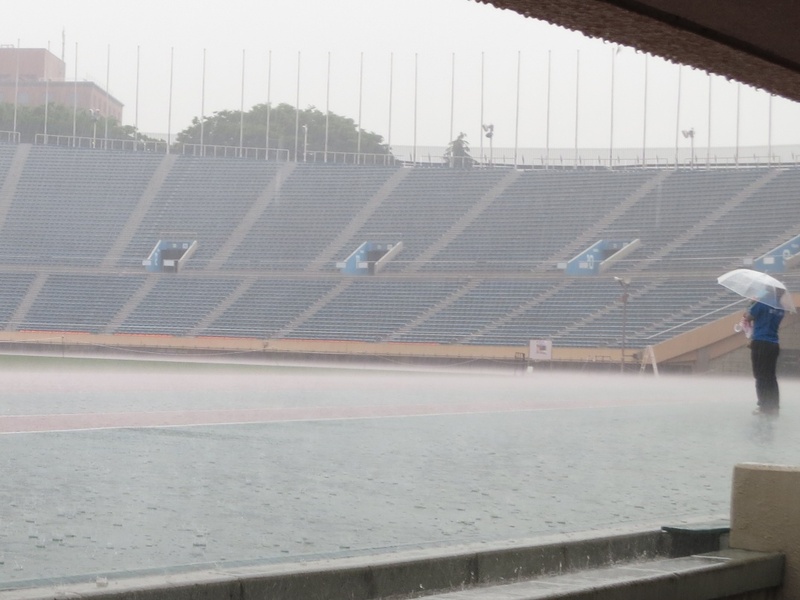 Another lone figure, a visitor, soon accompanied him, trudging up and down the length of the pitch, seemingly oblivious to the increasingly heavy downpour. The rest of us were left cowering from the fury of the wind and rain, seeking shelter under entrances, covered terraces and walkways. As the storm reached its peak, rain splash formed a fleeting calf-high mist as mother nature demonstrated her craft in creating a hallowed field. I stole on an intermission in her performance to make my way up the main stand, only to be greeted by a stream, a result of gushing drainage outlets at the sides of the aisles. 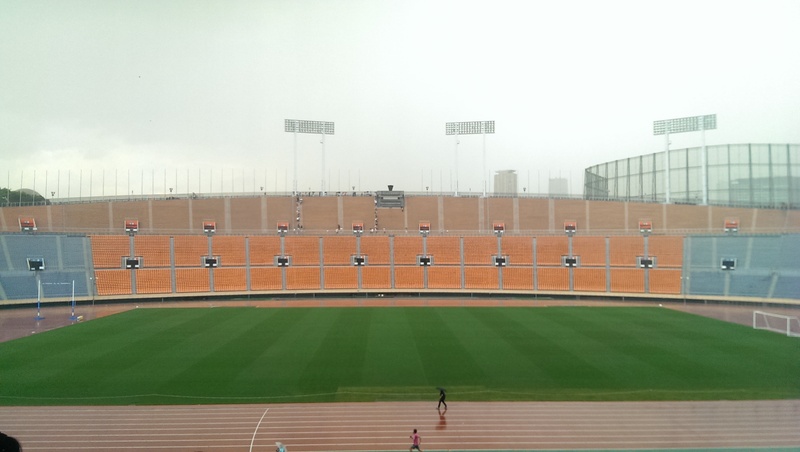 Sloshing up the slippery concrete steps and moderately strong current while being pelted by large droplets of rain, I took the fastest possible route to an open seat in the covered stands, brushing past two ladies who stalled midway in the rain with their brollies. Seating myself down in the main stand, I noticed someone starting off on the home stretch. He tore through the light rain and fell theatrically at the end, drawing warm applause for the performance. “That was pretty fast!” some said, amused and happy to have seen good sport today. My spectator experience thoroughly satisfied, I ventured forth to the cauldron atop the opposite stand. I joined the crowd on an flanking move. Making my way through the ground entrance and up a flight of stairs to the upper stands, I reached gate 37, the entrance leading to the famed cauldron. Once again out in the open, this time without any cover in sight, I glanced up the towering floodlights. The rain cloud was moving east, leaving clear blue skies behind its gray trail. Turning round to the west, my eyes immediately recognized the familiar Shinjuku skyline. Just a stone’s throw away, it seemed even nearer as a pretty backdrop adorning the main stand. A spectator tormented by the sight of his team could simply look away to enjoy the concrete landscape that stood over the horizon. The sight was enough to keep anyone distracted till something exciting happened on the grounds below. The back stand’s main attraction awaited. I refocused my thoughts and rejoined the queue. A single file formed along an aisle toward the cauldron. I waited in line, amazed by the live demonstration of impeccable orderliness so characteristic of Japanese society. We all played our part, shuffling toward the cauldron to take a prized photo or two. That was all the time we afforded ourselves with the crowd breathing down on us. Some took selfies in their business suits, others perched atop the fences or searched for the best possible composition. All this happened in line, with the rest of the stands empty. We all knew where the best vantage was, just follow everyone else! Past the cauldron, the line disappeared, the tension dissipated, and the euphoria subsided. A sense of nostalgia tinged with longing sadness quickly took hold. I would have loved to see a game here. Any sporting event, just to feel the wind in my hair and cheers reverberating across the ground. The open skies, flowing terraces, and flights of stairs in this arena was deprived of sporting endeavor, save the lone runner and some soccer jerseys. What will the future hold for its new incarnation? Its design will hold the key to the answer, and without doubt, it will not just be sport. 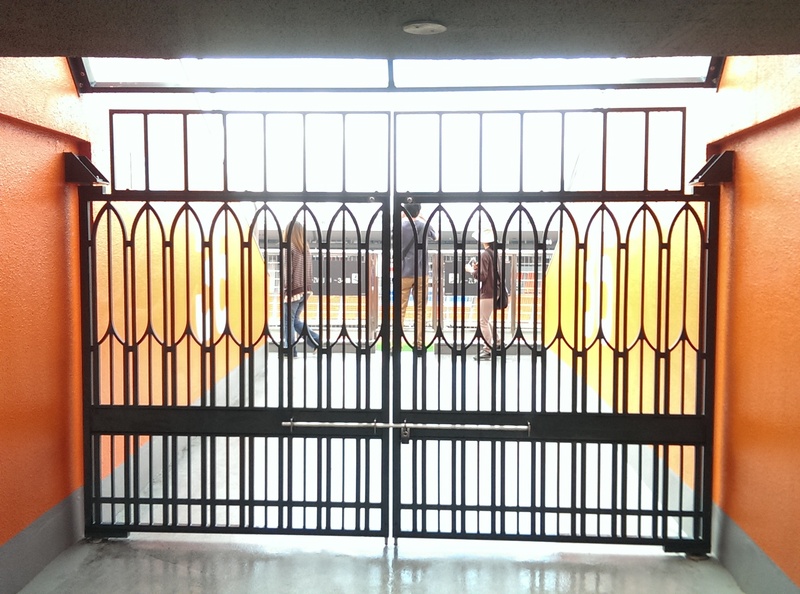 The crowd-guided tour had dispersed and I made my solo exit through an adjacent gate. It was the only other one open to us that day, waiting to be shut like the rest of them until the final farewell on the following weekend. As I made my exit, a local TV station caught a fellow visitor in Kashima Antlers colors, who was chatting away happily into the camera. On the way back down the last flight of stairs, I received a towel to remind me of my adventure in one of Japan’s sporting monuments.